The Munchkin Two Snack Catchers is on sale for $4.47 at Amazon right now. That's 47% off the list price of $8.49! Sometimes it seems all you have to do is follow a trail of crumbs to find your little one. Munchkin's best-selling Snack Catcher to the rescue! This lidded, portable snack bowl allows independent toddlers to self-feed with a bit more dexterity and a lot less mess. 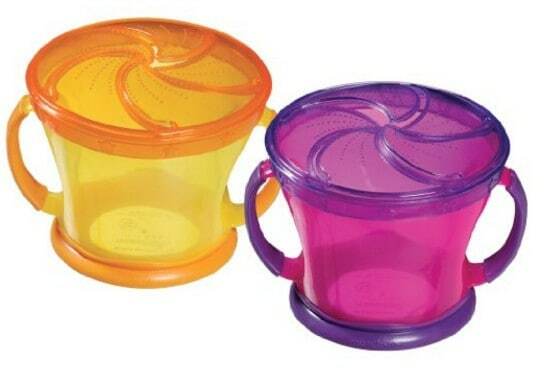 Snack Catcher food containers are a must-have for toddlers on the move. And because snacks come out only when they want them to, snacktime no longer means food everywhere except your child's mouth. Win-win for all! This is an add-on item and requires a $25+ order to ship at this price. If you don't have a $25+ order today, add this item to your cart so you don't forget to buy them when you do.